As a co-author of the paper, I couldn’t be more excited to share the results with the world. But most importantly, I want to emphasize that this paper, and the success it shows, would not have been possible without you. Over the years, our users have offered invaluable participation, feedback and support. We hope you’ll see this as something we’ve all accomplished together – and all of us here at InsideTracker want to thank you! 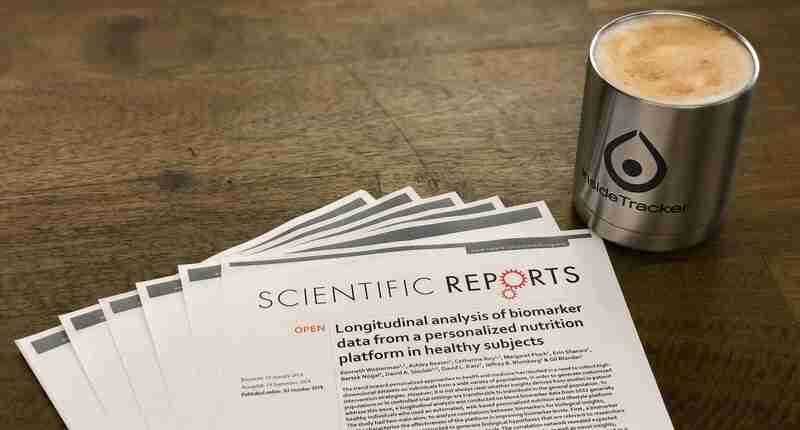 “Longitudinal analysis of biomarker data from a personalized nutrition platform in healthy subjects” – say what? Don’t stop reading at the long title! I’m here to break down the details for you. As its name implies, the paper focuses on our study of the biomarker data collected from more than 1,000 broad age-range users of the InsideTracker platform over time. Why do this, you ask? Well, we wanted to show the world, using data and rigorous scientific interrogation, that InsideTracker’s automated algorithm really does work to improve people’s wellness. The results validate that InsideTracker truly works to improve wellness through personalized nutrition recommendations. This isn’t just a fleeting fad – the results show long-term improvement in 14 of 17 biomarkers that are most commonly out of range in our user population. You’ll recognize the big ones, like glucose, cholesterol, testosterone, iron and vitamin D! The results validate that the InsideTracker algorithm is selecting effective nutrition interventions for each individual, based on their unique blood data, profile and preferences. 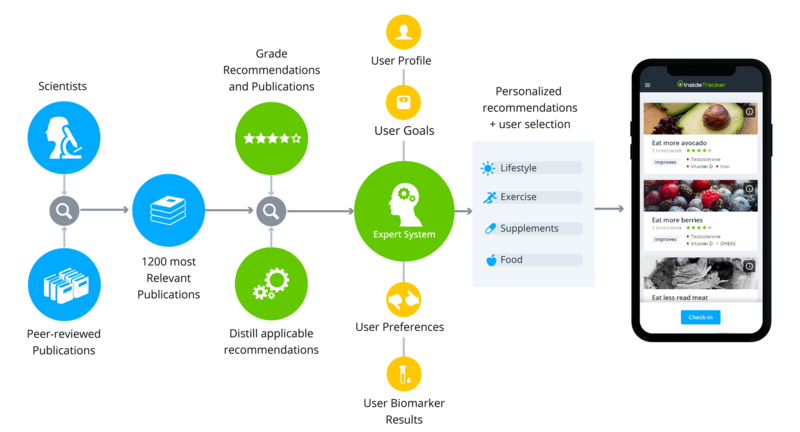 This is the very first study of its kind to show that not only can our automated algorithm generate effective personalized nutrition recommendations, but it works in generally healthy people (like our users)! Previous studies have focused on only sick people. 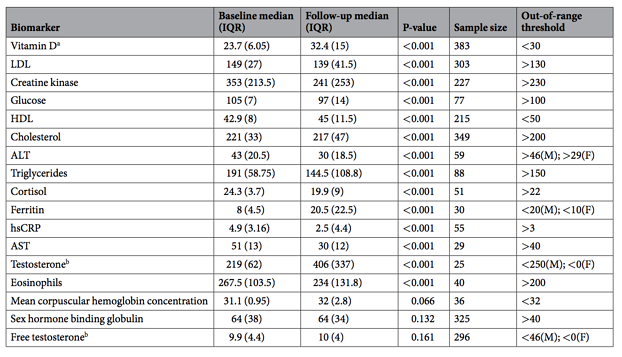 Don’t be overwhelmed by the data – this table simply shows the statistically significant improvements in biomarkers from initial (baseline) measurement to follow-up measurement, after recommended nutrition interventions were followed by participants. It’s always nice to be the first. And this is, to date, the first rigorous, peer-reviewed scientific study to show the success of an automated algorithm-based personalized nutrition and wellness platform in healthy people. Why does it matter? A few reasons. “This is an exciting milestone for InsideTracker – one that may be seen as a turning point in human health. I can imagine people looking back one day wondering how was it possible that people modified their diet blind to what was going on inside, and only went to their doctors once a year for a checkup or after they became sick." This simple graph from the paper shows clear improvement in LDL (“bad” cholesterol) levels when users followed any of the 10 most commonly chosen nutritional recommendations. An unexpected result was the consumption of more dairy as a recommended intervention. A paradigm shift: Indeed, the study marks a paradigm shift in how the worlds of medicine, nutrition, and technology are approaching wellness by confirming the growing popular belief that a personalized approach is effective in targeting specific, desired results. The days when people blindly make changes to their nutrition or lifestyle without taking a look inside are thankfully coming to an end. This shift extends far beyond our company. We’re thrilled to be part of that revolution – and you should be, too! Going further in the future: It’s not just about what we’re able to do today. Importantly, the study shows that a fully-automated algorithmic platform like InsideTracker enables analyses that can contribute to new biological discoveries which will improve human health in general, tomorrow. The future is bright! Cutting through clutter: We live in a world where scientific information is abundant but individual direction is often lacking. People are easily overwhelmed by an endless stream of advice from experts across the media, academia and healthcare. Proving that a smart algorithm can precisely identify the correct, simple solutions to address common wellness needs is a game changer. No more guessing games. A graphical depiction of the InsideTracker algorithm and platform. Focus on prevention: This study validates that InsideTracker is “P4 medicine” for healthy people. P4 medicine is a popular new term that means: Predictive, personalized, preventive, participatory. Waiting until something is broken to fix it is a costly and ineffective approach. Taking positive, personalized action to optimize your health before things break down is the new normal – P4 is the way forward. Accessible and lower cost: The InsideTracker system harnesses the knowledge of our experts on staff, plus on our esteemed scientific advisory board, along with a fully-automated algorithm to help users successfully improve their bodies. Using a scalable, algorithm-based system means this is done at a much lower cost compared to typical medical bills. Plus, it’s accessible to people in many parts of the world! Peer-reviewed acceptance: For those of you not in the world of science and academia, here’s the skinny – having a study peer-reviewed is critical to acceptance of any study results in the scientific fields. Think of it like quality control. It means that the paper has been reviewed by a board of scholarly reviewers (peers) who are experts on the topic the study covers. Okay, maybe that’s a bit dramatic. But our team did sweat quite a lot while attempting to churn out the very best paper, using the very best data available. Countless hours of analysis, writing, and revising went into the making of it. Over the past nine years, our science team invested more than 70 person-years of curated scientific work into building SegterraX (InsideTracker’s algorithmic engine) – that is to say, it took many years of hard work by multidisciplinary scientists to form this expert system. 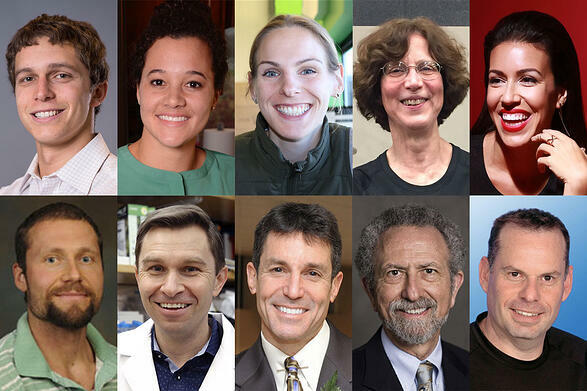 Leaders in the fields of nutrition, medicine, bioinformatics, genetics, and technology, contributed to designing SegterraX. The end result is a stunningly smart machine system that is constantly refined and perfected by real humans. Is healthcare about to be replaced by smart A.I., you ask? We don’t believe so. There's a lot of hype and promise around what A.I. can do on its own, but as our study shows, it still takes talented scientists, a rigorous and time-tested method, and years of hard work and patience to execute a viable platform like SegterraX. This suggests that currently, personalized wellness can be supported by A.I., but input from humans with vast expertise is critical to its ultimate success. "This study is important because it shows that the InsideTracker algorithm can guide people toward managing their own health by making appropriate dietary and lifestyle modifications," explains InsideTracker scientific advisory board member Leonard Guarente, Ph.D., Novartis Professor of Biology at the Massachusetts Institute of Technology. Indeed, it shows what we (and you, the users) have long experienced – InsideTracker works to improve biomarkers in generally healthy, motivated individuals. Of course, this is just the beginning of a long, exciting journey. While we have used blood biomarker data for this study, InsideTracker has also launched a DNA product, and our plans for the future include integration of wearable activity tracker data along with microbiome data. We’re constantly renewing our commitment to keep science at the core of our company by ensuring our products integrated the latest, most relevant research. As Rony Sellam, CEO of InsideTracker says, “The scientific way is certainly not the fast or easy way, but it is the right way.” Thanks for joining us on this amazing ride. Love the paper? Have a question? Leave a comment below; we want to hear from you!